Cole Tanner doesn’t do Christmas. Abandoned as a child on Christmas Eve, he has no use for the holiday season. 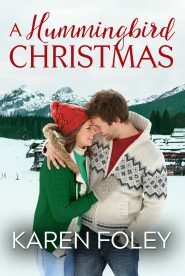 When his best friend’s widow arrives in Glacier Creek, Montana, determined to give her small daughter the fairy-tale Christmas she’s dreaming of, Cole is prepared to dislike her. He isn’t prepared for Joy and her daughter to insinuate their way into his life—and his heart. But when tragedy strikes, he needs a Christmas miracle to fulfill the one wish he never knew he wanted. Joy Holliday believes in miracles. She sees hummingbirds everywhere, and believes they are tiny messengers from Heaven. Despite losing her husband four years ago, she is determined not to dwell on the past, but to look to the future. Her entire world revolves around taking care of her daughter, Piper, and ensuring she has a magical Christmas. In Glacier Creek she finds Cole, a man still smarting from the wounds of his past, determined to keep happiness at arms’ length. Can she save Christmas and show him the promise of a future with her? Joy Holliday’s knuckles were white from gripping the steering wheel of the Honda CR-V she’d rented at Glacier Park International Airport just two hours earlier. What insanity had made her decide to drive to her in-laws’ house tonight, instead of booking a hotel near the airport and making the drive in the morning, as she’d told them she would do? The flight from Los Angeles had been delayed several hours due to high winds and snow in the Glacier Park region of Montana, but, by the time they’d landed, the snow had stopped coming down. The little town of Glacier Creek was only fifty miles or so south of the airport, and Joy had been sure it would be a quick, easy drive. She glanced in the rearview mirror at her small daughter, Piper, who sat buckled into a car seat, bundled up in a brand new winter coat and hat. Beneath the hem of the coat, the tulle skirt of her pink ballet tutu frothed around her legs. She’d insisted on wearing it, and Joy given up on trying to convince her that it wasn’t practical. She’d finally agreed, as long as Piper also wore a long-sleeved jersey and a pair of thick leggings beneath the insubstantial outfit. Now the little girl stared out the car window, mesmerized by the falling snow. Joy had promised her five-year-old daughter a white Christmas, and she’d sure managed to deliver on the white part. But what had initially been beautiful, light flurries when they’d picked up the rental car had swiftly become a thick, swirling whiteout, making visibility poor, if not impossible. The lines on the road had disappeared about an hour back, and Joy drove at a snail’s pace, terrified she would drive off the road. She had no idea how much farther it was to the town of Glacier Creek, where her in-laws lived, because she was too nervous to take her hands off the steering wheel long enough to pick up her phone, which lay on the seat next to her. She hadn’t passed a road sign in several miles, and gusty winds whipped off the lake to her right, billowing across the road, all but obscuring her vision. The little voice sounded anxious, and Joy recognized the warning signs of a child who desperately needed to be fed, and then tucked into bed. “I don’t want no more Cheerios.” A note of petulance had crept into Piper’s voice. Joy frowned. There was no place to safely pull off the road and, even if there was, her daughter would never agree to relieve herself on the side of the road, even if the weather had allowed it. Then Joy saw it—the road sign that indicated they had just entered the town of Glacier Creek. Thank goodness. She’d studied the map so hard before they’d left the airport she’d almost memorized the directions to her in-laws’ house, and knew the turnoff to their road was less than a mile from the town limits, on the left. If she reached the town center, then she’d gone too far. But with the snow coming down so fast, she couldn’t see any landmarks, and she almost missed her turn. Worse, darkness had fallen and her headlights did little to penetrate the whiteout. She turned the small SUV onto the road that led to her in-laws’ house, and then reset her odometer. This was a private road, owned by the Holliday family. There was one more turn she needed to make, and it was exactly three-quarters of a mile from the main road. If she missed this next turn, the road continued into the heavily timbered foothills of the Mission Mountains, where her father-in-law owned a sawmill and lumber company. She drove slowly up the steady incline, giving the car a little more gas in order to avoid getting stuck on the snow-covered road. Evergreen trees pressed in on both sides, heavily laden with white snow. At any other time, Joy might have found the winter scene breathtaking, but not now. She would be grateful when she made the next turn, and the large timber frame house came into view. In the split-second that Joy had taken her eyes off the road, an enormous pickup truck with a plow on the front appeared, seemingly out of nowhere, directly in their path. The oncoming headlights were blinding and Joy had only an instant to react, slamming on the brakes and yanking the wheel hard to the right in order to avoid a head-on collision. The car fishtailed violently, and then they were sliding off the road as Piper screamed in terror. There was a jarring impact and the terrifying sound of crunching metal, and then it was over. They had come to rest in a ditch, up against a tree, and the car had pitched sideways at a steep angle so that only the seatbelt prevented Joy from sliding into the passenger seat. Frantically, she twisted around to see Piper, still strapped in her car seat, eyes wide with terror. Piper shook her head, mute, and Joy went weak with relief and the aftereffects of the adrenaline rush. Her headlights were still on, and the wipers still swept the falling snow from the windshield in a steady, rhythmic motion, but everything was otherwise silent. Where the hell had that truck come from? This was a private road, owned by her in-laws, but she couldn’t see her father-in-law driving in this weather. And what was she going to do now? As if in answer to her unspoken question, there was a knock on her window, and she looked around to see a man peering through the glass at them, motioning for her to unlock her door. With the car settled almost on its side, he seemed to loom above her. The headlights from his truck were bright, and all she could make out was a dark silhouette. Knowing she didn’t have much choice, she hit the unlock button. Did you know that A Hummingbird Christmas and many titles are available digitally from Tule's own bookstore? Check it out!